The Halfway House orchard was planted on Saturday, 16 July, 2016. Sixteen trees were planted and each was donated by someone in the local community. Additional orchard plantings have since been made. Some remnants of the original Halfway House orchard remain, such as elderberries, a yellow fleshed red skinned plum, and a red fleshed cherry plum. Varieties named in early settler letters, or published journals written about The Halfway - Glenside since 1840. Named varieties available or growing locally when the existing Halfway House was built, which was in the mid-Victorian period. Whether the fruit trees could be pollinated by each-other or were self-pollinating. Some post Victorian era fruit trees were selected for pollination purposes. These trees were chosen for the likelihood of being planted in a farm orchard or kitchen garden. The Onslow Historian, Volume 22 (1994) in which Eva Samuda nee Stebbings, recounted memories of the Stebbings orchard on the family farm. The Stebbings family had farmed The Halfway - Glenside since 1863. W.W. McCardle’s General Catalogue of Fruit Trees, Shrubs, Seeds etc 1878. Mr McCardle supplied the Wellington Province with fruit trees. 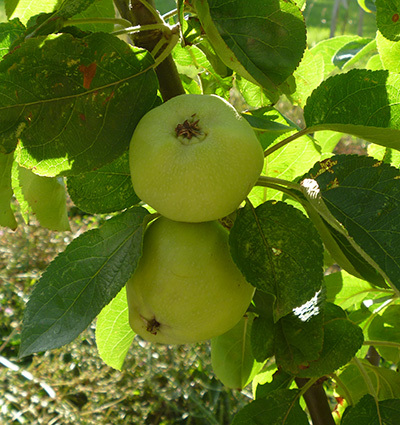 Tom Putt apple trees - also sometimes called Jeffreys Seedling, produce large, rather flattened red, shiny apples with the odd green patch. Tom Putt apples are superb cookers, with a light flavour and melting-sweet texture. They are also an ideal choice for the sharp element in a blended cider. Finally, they are also easy to juice, making tangy rich flavoured juice. A Tom Putt tree is a real trooper; it is vigorous, begins cropping young and bears large, steady harvests year in, year out on branches that have a spreading habit. They are very resistant to scab. Grown in Stebbings orchard. "Tom Putt was to us the perfect apple. It was rather flat and where the flower head had fallen off five odd little weal marks converged like quaint tear drops. Its colouring was magnificent – a bright, flowing red – and its flavour out of this world The most intriguing part to me, however, was the pinkness of the flesh which penetrated the apple for a good quarter of an inch. One wonders why some of those apples lost their popularity." Memories of Eva Samuda (b1907) nee Stebbings, Onslow Historian, 1994. Gifter: Paul and Heather Bicknell. Large size. Dark red skin, red flesh. Firm plum. Very sweet. Can be picked over several weeks. Ripe January. An early settler plant found growing wild on the roadside in Tamaki. From the Henry Harrington Southland collection, which Henry collated from plants growing wild along railway lines along the tracks near Ohai, an old coal mining area and a trail the old goldminers used. The gooseberry are a large black red fruit, very sweet, sub acid with a strong aromatic aftertaste. Outstanding cultivar, ripe December. Planted: Horse paddock fence line. Originating from United Kingdom. A medium sized apple with a sharp tangy flavour. The skin is striped red over green background. Best dessert apple of all. Ripening early to mid season. Grown in Stebbings orchard and listed in W.W. McCardle 1878 catalogue. Small to medium size. Clear golden russet skin. Flavour is sweet and rich with a vanilla taste. Flesh texture is compact and nutty. This is the best of the old English russet apples and one of the healthiest varieties for use in home gardens. Heavy cropping. Grown in Stebbings Orchard. Gifter: Peter and Pauline Russell. Developed in New Zealand. A cross between Golden Delicious and Cox's Orange Pippin. Freyberg has an aromatic, creamy, white flesh with a fine and juicy texture that makes it a pleasure to bite in to. The small, greenish-yellow russeted fruit has a mid season ripening time. These apples hang well and continue to develop flavour even when very ripe. World famous apple with great taste, texture, aroma and appearance! Golden Delicious produces very sweet honey flavoured fruit, especially when tree ripened. Apples ripen yellow. It produces on both tips and spurs. Self fertile. Crops regularly and heavily late in the season. Originating from Ireland, this apple ripens early in summer. The skin is green with faint red stripes and the flesh is high quality with a very good flavour. This apple will not store well and is best eaten straight from the tree. This apple bears its fruit on the tips of the branches and it pays to be aware of this when pruning i.e. don't cut back all the strong leaders with fruiting tips. Early. Grown in Stebbings orchard. "In the lower orchard grew three large Irish Peach apple trees. By late December the apples were ripe and sweet and as soon as the hay was cut in the lower part of the orchard we would dash down and collect the windfalls and bird-pecks. This we did every morning until the trees were picked, the first arrival collecting most of the juicy 'loot'." Memories of Eva Samuda (b1907) nee Stebbings, Onslow Historian, 1994. This large and handsome heritage apple from America has yellow skin that is heavily splashed with red. Excellent flavour with slightly yellow flesh that is crisp and juicy. Great for cooking as well as fresh eating. Stores well and once established requires very little attention. Late. Grown in Stebbings orchard and listed in W.W. McCardle 1878 catalogue. 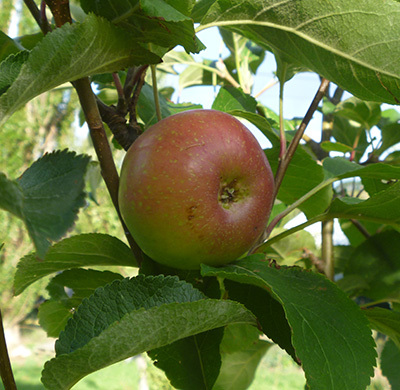 The origins of the name of this apple are that Mrs Peasgood from Lincolnshire planted five apple seeds from an un-named cooking apple, only one germinated and it produced such a wonderful apple it was named after Mrs Peasgood and the Nonsuch part of the name translates as "without equal". Huge, flat, highly coloured fruit with red stripes. Highly esteemed for culinary purposes. The flesh is firm, juicy and tart with the right blend of acid and sweet. When stewed the flesh breaks down to a 'froth'. This apple is the perfect choice for baking - especially apple pies and apple sauce. Matures late summer to autumn. Grown in Stebbings orchard. In memory of: Maria Lambertha Johanna Slieker (Mary) 1929-2000 and Pieter Christoffel Slieker (Peter) b1929. Very good cider apple originating from Devon, England in the 1700's. Large, oval, yellow skinned, yellow firm fleshed fruit of sweet and fine flavour if fully ripened on the tree. Requires a sunny aspect to fully ripen the fruit. Mid-season. Listed in W.W. McCardle 1878 catalogue. English Plum. Small oval fruit, with amber green flesh and blue-black skin with attractive bloom on surface. A spreading tree with moderate vigour whose fruit ripen mid-season and is self-fertile. Make excellent jam, preserve, chutney and pickles. Birds generally not interested in the fruit. The trees are vigorous and bear prodigiously. Disease resistant. Listed in W.W. McCardle 1878 catalogue. The original greengage, introduced in France in the sixteenth century, and named 'Reine-Claude' in honour of the King of France's wife. The small to medium sized fruit are green, or in some variants, greenish yellow. The flesh is a translucent greenish yellow, and the taste is pure nectar. It is one of the most refined and exquisitely flavoured plums there is. Most variants have a fairly high winter chilling requirement, and fruit poorly if at all in warm temperate areas. Mid-season. Listed in W.W. McCardle 1878 catalogue. Gifter: Marg and Barry Ellis. Ripening in February each year the Moorpark apricot is a late variety and a real treat when eaten ripe from the tree. Can also be bottled or dried. Prefers a warm sunny position however is very cold tolerant. Self fertile. Prune only in summer on a warm dry day. The Moorpark apricot was named from Admiral Lord Anson's estate Moor Park in Hertfordshire, England where he introduced the apricot. Origin, China. Listed in W.W. McCardle 1878 catalogue. The Brown Beurre was for a long time, considered the prince of pears in France, its native country. For those who are partial to the high vinous flavour - a rich mingling of sweet and acid - it has still, few competitors. Listed in the W.W. McCardle 1878 catalogue. William bon Chretian and Winter Nelis. Two pear trees grafted onto rootstock. William bon Chretian is often simply known as 'Williams'. The fruits of this superb pear turn yellow as the flesh ripens. It is an early fruiting variety producing large yellow non-gritty fruits with an excellent sweet and juicy flavour. This British bred pear is perfect for poaching and preserving, as well as eating fresh from mid to late September. Listed in the W.W. McCardle 1878 catalogue. Winter Nelis was raised from seed by Jean Charles Nelis, Mechlin, Belgium, early in the nineteenth century. Introduced into England under the name of La Bonne Melinois. At a later date, the name Nelis d'Hiver was substituted. From this name came the English equivalent, 'Winter Nelis'. Fruit small to medium in size. Skin fairly thick, but tender. Flesh fairly fine except for grit at the centre. Buttery, moderately juicy. Spicy, rich flavour, rates very high in dessert quality. Late keeper. Both pears are listed in the W.W. McCardle 1878 catalogue. Supplier: Supplier: Wairere Nursery, Gordonton. Gifter: Jan Voss & Guy Beatson. In memory of: Guy Beatson's ancestors, the Williams, who immigrated to Nelson, New Zealand in 1841. 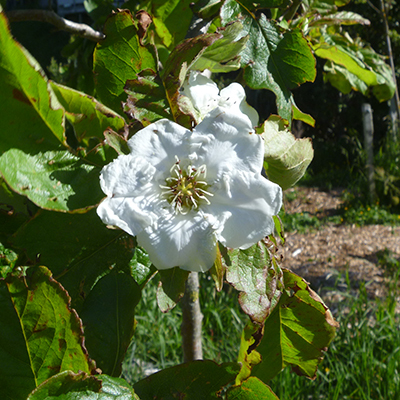 Medlar’s are ornamental flowering trees with pretty blossom and good autumn colour. The fruit is tart if eaten raw, but makes pleasantly flavoured jellies or can be used in desserts, or as a fruit paste on firm cheese. Left to soften or 'blet' the fruit mellows and is a traditional, if unusual, treat. In the United Kingdom this is a 'winter fruit' dating back to medieval times. It originates from ancient South West Asia and South West Europe. Max Dorset grew medlar at Ivy Bank Farm in Glenside and would blet the fruit in a bed of dried grass in the upstairs front rooms of his house. 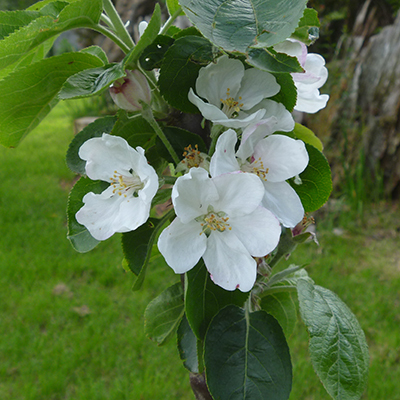 Grown in Stebbings orchard and listed in the W.W. McCardle 1878 catalogue. In memory of: Herbert Edward Dorset (Max) 1917-1911. This is the quince grown at the Brown Sugar Café in Taihape. Matures in February to March and is a self-fertile variety. The quince originates from ancient Turkey.